WARNING: Even though CEX.io states on their website that a full verification is only needed for FIAT transactions, it happened to us that they suddenly changed their mind and demanded a full verification and personal documents even though we never withdrew or deposited FIAT currency. CEX.io refuses access to the funds. It seems the company acts as they wish without following to their own terms & conditions. We do not recommend to deposit any currency on the platform, nor do we recommend to use them for trading. Located in London, England, CEX.IO was established in the year 2013 and is one of the oldest Bitcoin exchanges operating today. The company originally was also a bitcoin mining provider, and its mining pool GHash.IO was named number one, holding the majority of mining power. However, in January 2015, the company’s cloud mining services were suspended, and it now operates only as a Bitcoin exchange, and a leading one in the market. CEX.IO is registered with the Financial Crimes Enforcement Network (FinCEN) of the US and the Information Commissioner’s Office (ICO) in the UK, which typically means that it is legally compliant in both these countries. In addition, to prevent and eliminate potential risks of the company getting involved in illegal activities of any sort, there is an Anti-Money Laundering (AML) and Know Your Customer (KYC) policy in place. As a result, every user will be required to verify their identity before purchasing Bitcoins from the exchange. With more than 970,000 active traders, CEX.IO is one of the best in the industry, and if you are looking for a reliable platform to buy or sell Bitcoins, you should spend time learning more about this cryptocurrency exchange platform. CEX.IO is available in English, Chinese, Russian, Portuguese, Italian, and Spanish, which makes it a six language platform. Hence, the website is convenient for access by people from different countries, without the need to be fluent in English. When it comes to world coverage, the platform provides its Bitcoin exchange services in 99% countries across the world, which is inclusive of 24 states in the US alone. Recently, CEX.IO has also added countries like India, Hong Kong, Argentina, Nepal, Malaysia, Bangladesh, Venezuela, Colombia, and Indonesia to its list of countries available for card withdrawals, and this has further expanded the efficiency and convenience of the service. CEX.IO supports the use of Visa, MasterCard, SEPA and SWIFT bank transfers, and also cryptocurrency payments. The website encourages the use of their card manager for faster deposits and withdrawals using your credit card. All that needs to be done is provide the right information about your credit card and prove that you are the owner of the same. You can use multiple cards on the platform, by simply linking them to your profile. To buy or sell Bitcoins on the platform for US dollars or Euro, you need to visit the Buy/Sell page on the website, choose the amount of Bitcoins you wish to buy or sell, enter a custom amount, or choose a bundle you like. Make sure that you have funded your account first with Bitcoins or USD/EUR. 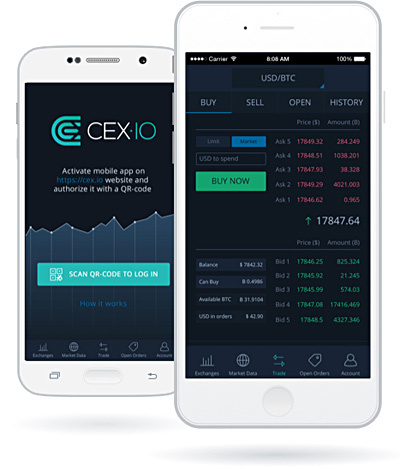 CEX.IO also offers a mobile app for iOS and Android devices, which makes it easy for you to carry out Bitcoin trading on the go. You can manage your mobile devices or add a new device by clicking on the CEX.IO Mobile tab in Profile. 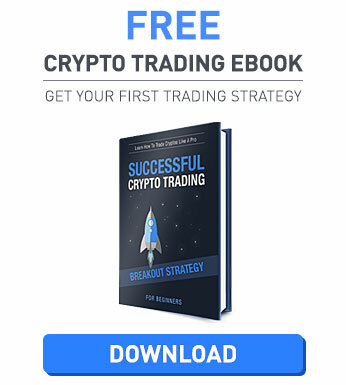 When it comes to buying, selling, and trading on a cryptocurrency exchange platform, we all know that security is extremely important. 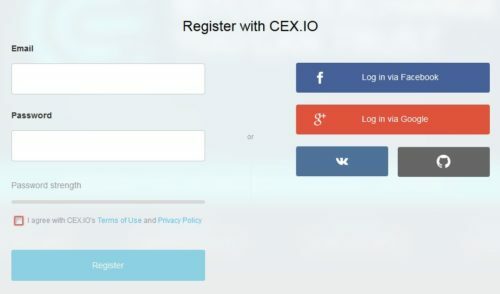 CEX.IO takes security seriously and encourages all its users to enable Two-Factor Authentication to secure their account. If not, you can also set up authentication through a phone call or SMS, whichever option you find convenient. Once again, the platform allows you to manage your security preferences in your Profile page. CEX.IO offers great protection against DDoS attacks, provides complete data encryption, and is also compliant with PCI DSS standards. All of these security features together make the platform one of the most reliable and secure Bitcoin exchanges active today. The CEX.IO website is straightforward and easy to use. Despite hosting a modern website design, the platform is still user friendly and offers a secure trading engine. 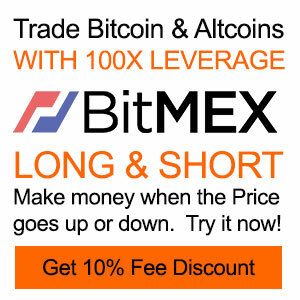 Signing up with the Bitcoin exchange is free, easy and fast. However, in order to know more about the platform and its service, you will be required to sign up first, which sometimes can be quite annoying, especially if you are looking for important information to help you make your decision. To register with the service, all you need to provide is your Email and preferred Password. The platform also allows you to log in with your Google or Facebook account. As we mentioned earlier, since the platform has a Two-Factor Authentication in place, you will be required to provide your phone number for security reasons. And in order to start making Bitcoin exchanges with your credit card, you will have to add a bank account to your CEX.IO profile. Not to forget, the mobile app offered by the company is equally good and easy to operate, and hence will be the ideal option for those of you who are frequent travelers or always on the go. In this section of our CEX.IO review, we will be looking at the customer support offered by the Bitcoin exchange platform. When it comes to support, the only interactive option offered by the company is the submission of a request. We weren’t able to find a chat facility, an email address, or a phone number on the website. There are help features like an FAQ section and a Community. However, we don’t think this is enough for a currency exchange company, especially for a leading service provider like CEX.IO. Other than that, there is also a Suggest a Feature section, which you can access only by logging in. CEX.IO is definitely a solid cryptocurrency exchange platform that lets you use your credit card to buy, sell or trade Bitcoins. Offering excellent security, this is a solid and reliable platform that you can depend on for your exchanges without any concerns. However, it does lack in customer support options, which can be frustrating when you are in need of immediate help.